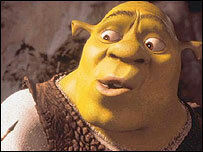 Shrek 3's premiere has been delayed to 2007 because the Dreamworks studio has changed its release schedule. The move follows Pixar and Disney's decision to delay the release of Cars to give it a summer opening in 2006. Dreamworks chief executive Jeffrey Katzenberg admitted its rivals' date change had prompted the move. The companies hope releasing movies during school holidays will boost takings, followed by DVD releases around the profitable Christmas season. "The sheer magnitude of the Shrek franchise has led us to conclude that a May release date, with a DVD release around the holiday [Christmas] season, will enable us to best maximise performance and increase profitability," said Mr Katzenberg. The first two Shrek films proved enormously successful, taking $708m (£369m) in the US alone, and a musical about the green ogre is also set for Broadway. The third instalment was originally set to be released in the winter of 2006, but will now see the light of day six months later. Disney-Pixar's next big collaboration Cars will be released in the summer of 2006 instead of November 2005. It will hope to build on the box office success of superhero animation The Incredibles, which saw its takings in its opening week top that of Finding Nemo.